The Gourmet Riches Kosher Gift Basket is a wonderful way to indulge your special recipient with an array of tempting treats! 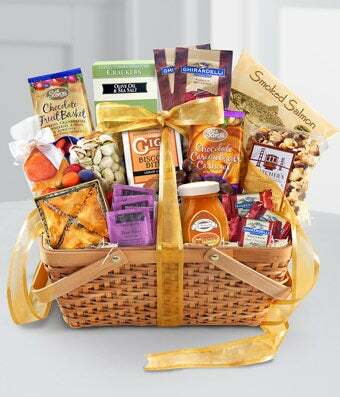 Arriving in a beautiful natural woven handled basket, this gift includes a selection of Kosher items from chocolate to honey and dried fruit. Every item is certified kosher by a leading kosher certifier and clearly marked with certification.